State Rep. Laura Sibilia, I-West Dover, serves on the House Commerce and Economic Development Committee. BRATTLEBORO—Windham County’s three new legislators say they have taken their first legislative session in stride, but not without a fair share of learning curves. “It was a very odd session,” remarked Sen. Becca Balint, a first-year Democrat from Brattleboro who joined veteran Democratic Sen. Jeanette White of Putney in representing the county. The session began with a $113 million budget gap that lawmakers had four months to close, and it also started with the governor’s race undecided. But the oddness didn’t predominate. “I love the job — that’s first and foremost,” said Balint during a phone interview. Despite the condolences offered by friends when she won the Senate seat last year, Balint was jazzed by big ideas, creating policy that improves people’s lives, meeting new people, and connecting to people in Montpelier who can help Brattleboro. Newbie legislators have traditionally been advised to “be seen and not heard” while learning the ropes. Balint didn’t follow the advice. She felt “excited and proud” to be picked for a conference committee on this session’s economic development bill, an unusual honor for a first-term senator. Such committees, comprised of lawmakers from both chambers, iron out inconsistencies between their respective versions of legislation into one compromise bill that, if approved by the House and Senate and then signed by the governor, becomes law. “It was delightful for me,” Balint said. 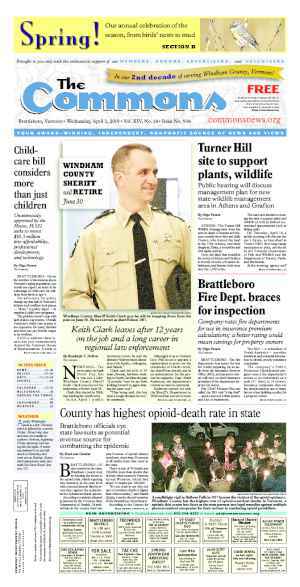 Reversing Windham County’s declining economy was one of the reasons Balint ran for the Senate. In Balint’s opinion, Vermont has two economies. One is the robust real-estate market and strong job growth of Chittenden and Franklin counties. Then there’s everywhere else. Balint commended the work of fellow lawmaker Rep. Laura Sibilia, I-West Dover, for her work on the economic development bill. The bill contains an unfunded pilot program to launch a southern Vermont economic development zone, Balint explained. Similar to collaborations that happened after Tropical Storm Irene, Bennington and Windham counties will partner on economic development initiatives. The goal is to discover what structures or policies are needed for improving the economy on a regional scale. Economic development touches everything from job growth, to a real-estate market young families can afford, to opioid abuse, she said. “You can’t deal with economic development as a stand- alone [issue],” Balint added. Balint also pushed this session for better funding of the judiciary. “Access to justice is critical for all of us but most importantly for our most vulnerable citizens,” she said. Through multiple conversations with members of the Senate appropriations and institutions committees, like Sen. Peg Flory, R-Rutland, Balint said she persuaded the enacting of key changes to fill empty judges seats. The administration has used “vacancies savings” — leaving positions unfilled — to keep costs down, Balint said. The result was fewer people doing just as much work. Other changes included an overdue revamping of the court fee structure and securing money for a new IT program designed to create efficiencies in the court system. Passing a consumer protection bill, also called the rent-to-own bill, made Balint feel good. She appreciated the trust senior senators placed in her as a newbie to move committee work forward. Ending the session with the arrest of Sen. Norm McAllister, R-Franklin, took Balint by surprise. Balint served on the Senate Committee on Institutions with McAllister, who allegedly sexually harassed a legislative intern who worked with the committee. “I really just felt nauseous,” Balint said. Balint also served on the Senate Committee on Economic Development, Housing and General Affairs and the Joint Committee on Judicial Rules. McAllister pleaded not guilty to three counts of sexual assault and lewd and lascivious conduct. While he has not resigned, the two-term lawmaker was stripped of his committee assignments. “We’re in uncharted territory,” Balint said. Balint, who noted that McAllister never behaved inappropriately toward her, said she vacillates between wanting to respect McAllister’s right to innocence-until-proven-guilty and her uneasiness. “We’re all in a way waiting to see if he resigns,” Balint said. As an institution, the Senate has never dealt with such a situation, Balint said. Many Senators didn’t know how to deal with the emotional fallout or protocol. The Legislature’s response to the arrest heartened Balint. She said that she has had conversations with members of Senate leadership who say that the event has spurred the chambers to reevaluate their trainings and policies. First-time State Rep. Emily Long, D-Newfane, said she’s lucky — she doesn’t need a lot of sleep. Which is a good thing, because “you have no free time. None,” she said from her home in Newfane. Long added committee work, debates in the House, research, and returning communications kept her on her toes. She also attended Rep. David Deen’s Friday morning Legislature 101 workshop for first-year lawmakers. “There’s no quiet space in the building,” said a surprised Long, adding that legislators hid behind curtains if they needed to return a phone call. The busyness didn’t stop when Long returned home on Friday nights. The new lawmaker felt a responsibility to attend local events and meetings to keep in touch with issues important to her constituents. Long said she really liked the first session. Long heard from fellow lawmakers that the session was a challenging one, but she had no comparison. Born in Townshend, Long grew up in Newfane, where she has served more than 20 years as a school board member. She loves her home state to her core, but its sluggish economy concerns her. She wants to preserve the “Vermont culture and lifestyle.” She wants to help create a state where her two grown children can stay and thrive. “There’s a lot of work to be done in Vermont,” said Long, who served on the House Education Committee this session. It was important to her to have a voice at the state level to take on the challenges schools face with governance, funding, and declining enrollments. Even despite student populations on the wane, it’s important to maintain a school environment where kids get the education they need to prepare them for jobs in the global economy, she said. Long views the controversial school governance bill that passed this session as an opportunity to effect change from the grassroots level. Governor Peter Shumlin signed the bill into law on June 2. Citing the 24-percent decrease in student population from 1997 to 2015 but no corresponding decrease in educational administrative costs, the bill offers incentives for school districts to merge. Vermont schools aren’t sustainable as they operate now, she said. If change is inevitable, then she wanted as a lawmaker to do the best she could to include local voices in the conversation. A criticism of the bill is that it will close small schools, though the text of the legislation overtly says, “It is not the State’s intent to close schools and nothing in this act shall be construed to require, encourage, or contemplate the closure of schools in Vermont.” But Long wonders if those small schools wouldn’t close anyway. She hopes that the collaboration encouraged in the bill will help small schools work together to become vibrant. “We are very creative here in Vermont,” Long said. It’s easy to get caught up in the mechanics of how Act 60 and 68 operate, she said, but people forget that declining enrollments and high staffing levels drive costs. Although she didn’t have time to focus on economic development this session, growing the economy remains at the forefront of her mind. In a recent conversation with two Marlboro College graduates, Long learned that they would likely leave the state they had grown to love. They couldn’t find jobs that paid enough to support their day-to-day needs and pay their student loans. The closing of Vermont Yankee and the loss of its high-wage jobs will not help the region, she said. Long also hopes next session to take a hard look at programs that support families like paid sick leave. As a school board member, she has witnessed countless kids come to school sick because their parents couldn’t afford to take time off from work. Laura Sibilia expected to learn a lot and was not disappointed. After the arrest of McAllister and other challenges faced this session, Sibilia said it felt good to return home for quiet reflection. “It was an interesting juggle,” she said, describing the challenges of managing her Statehouse duties, her family, and her job with the Brattleboro Development Credit Corp. There, she works as director of economic and workforce development and as the point person for Southeastern Vermont Economic Development Strategies (SeVEDS). As one of four independents in the statehouse, Sibilia said the indie status came with blessings and challenges. The first three weeks of the session were a “treasure hunt” as the independents tried to find things like meeting rooms or name tags. The three major parties traditionally orient their fledgling lawmakers, she said. But, Sibilia added, no one could tell the indies what to do. With her flexibility to spread her lawmaker’s wings, Sibilia organized a small-school caucus. She spent time working with representatives on both sides of the aisle. Sibilia also served on the House Committee on Commerce and Economic Development, and her efforts with the economic development bill brought home the need in Vermont for more long-term investment and continuity of leadership. Sibilia has come to believe that the terms for the governor and state senators should be longer. Those officials need more time to launch projects and initiatives, and the two-year terms should increase to four years so the leadership can get traction, she said. When the economic development bill first hit the Senate, Sibilia said she felt “super excited” by what she viewed as a solid bill. Unfortunately, she said, the bill was “decimated” in the Senate committees, where all the initiative funding was removed. 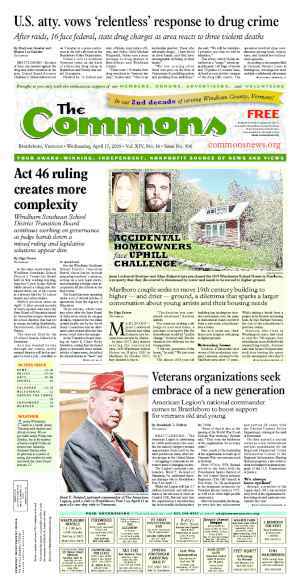 Still, some of the proposals within the bill remained strong, like the first-time homebuyer tax credit and an expanded Vermont Employment Growth Incentive (VEGI) program. VEGI is a tax incentive for new or expanding businesses that hit certain wage and workers’ benefit thresholds, explained Sibilia. Overall, Sibilia said she would like to see the state create more economic strategic action plans rather than short-term projects. She wants to see the effects of the bills passed this session before making a call on them, she said. She admits that health care policy is not her strongest interest, but it remains an issue she will watch. “We don’t have enough doctors, and we don’t have enough incentives for the doctors to come,” Sibilia said. According to the Vermont Department of Health, most of Vermont does not meet physician shortages standards set by the federal government to receive assistance from programs like National Health Service Corps or Nurse Loan Repayment Program. Sibilia added that she looks forward to developing a greater understanding of health care and how to deal with the challenges facing health care in Vermont next session. But, the ed bill was a “done deal when we walked in,” she said. Sibilia is outspoken on the issue of protecting small schools. A Dover School Board member, she has also remained outspoken about providing a quality education for all Vermont students and revisiting the funding mechanisms that drive property taxes. “Everybody participates in the problem,” she said, but the education governance bill puts the onus of solving the problem on the small schools. Small schools equal about 5 percent of the education spending and student population, she said. Going after the small elementary schools will “not make a dent” in education spending. Ultimately, Vermont’s education funding has a disconnect between spending decisions and property taxes, she said. For an example, Sibilia said Dover raises $13 million in education taxes. It spends approximately $2 million to educate its students. The town sends the remaining $11 million in tax education tax money to the state. No one at the state level can tell her where that $11 million is spent, Sibilia said. That’s a lot of money to not understand where it has gone or what education opportunities it has funded. Sibilia eventually voted for the education bill for three reasons. 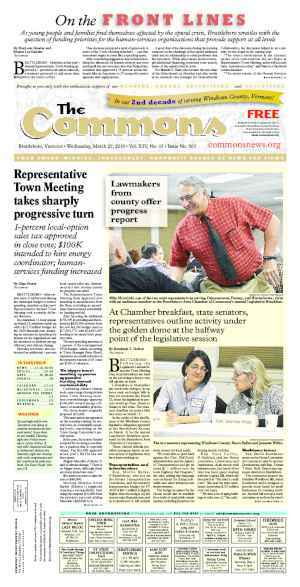 She credited Rep. Oliver Olsen, I-South Londonderry, for helping revamp portions of the bill. The first reason was the bill finally included additional criteria for small schools to retain the small schools grant, for example the ability of nearby schools to absorb the small school’s students. “Who could take Readsboro’s kids,” said Sibilia of the relatively geographically isolated town. The bill also supports providing higher quality education for all students, she said. Finally, the bill includes spending caps and penalties that will hit schools of all sizes not simply smaller schools, she said. Overall, Sibilia said that she worked with a number of committed and passionate people looking to do right by their constituents. A number of well-intended people have put their shoulder to the wheel in Montpelier, she said. “I was really relieved to find good people,” Sibilia said. 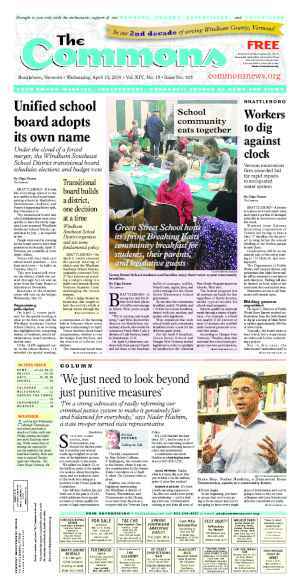 Originally published in The Commons issue #308 (Wednesday, June 3, 2015). This story appeared on page A1.